"When the Saints Go Marching In" has been adopted as the anthem of the city of New Orleans and is the fight song of its football team, The Saints, named in its honor. “When the Saints Go Marching In,” often called “The Saints,” is a traditional American hymn that New Orleanians have adopted as their unofficial anthem. Originally published as a spiritual, the hymn was a favorite instrumental in traditional jazz funerals during the early 1900s. 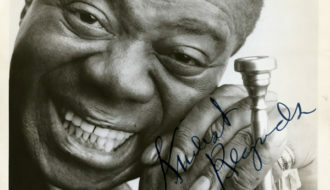 Its popularity increased through more upbeat recordings by Louis Armstrong, Fats Domino, Elvis Presley, and many others. Today, the New Orleans Saints football team, named in honor of the “The Saints,” uses it as the team’s fight song. Most New Orleans musicians would agree that “When the Saints Go Marching In” is the most requested jazz song of all time. 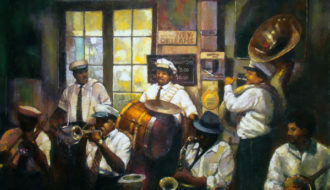 For example, at Preservation Hall in New Orleans’s French Quarter, requests cost from five to ten dollars, except for “The Saints,” which costs twenty. Why so much more? The usual explanation is the musicians have played the song so many times that they are tired of it and need special inducement to play it. Another explanation originates with the death of a popular musician. On January 22, 1965, Papa John Joseph, the bass player at Preservation Hall, had just finished playing a rousing version of “The Saints” when he turned to his band mates and exclaimed, “That about took everything out of me.” He then collapsed and died on the spot. Composer credits on jazz recordings of “The Saints” usually classify it as traditional, but the origins of the song are as mysterious as its extreme popularity. Many scholars attribute the tune of the1896 Protestant hymn to James M. Black and the lyrics to Katherine E. Purvis. That song, however, was actually titled “When the Saints ARE Marching In” and many scholars now hold that this was an entirely different piece of music. Of course, it is not a mystery that for jazz lovers the song’s history dates from Louis Armstrong’s recording of the song for Decca on May 13, 1938. During the 1920s, both sacred and secular artists covered “The Saints.” The Elkins-Payne Jubilee Sisters recorded a version in 1924, Atlanta’s Wheat Street Female Quartet performed it in 1925, and Rev. E.D. Campbell included it in his 1927 sermon “The Hem of His Garment.” It was also covered by bluesman “Barbecue Bob” Hicks in 1927 and Blind Willie Davis in 1928. In the early 1930s artists such as Slim Duckett and Pig Norwood, Clara Gholston Brock (better known as The Georgia Peach), and the evangelist Reverend Snowball recorded the song. In other words, by the time Armstrong got around to recording it, “The Saints” had already been thoroughly secularized and had entered the popular mainstream via recordings made for both black and white markets. In addition to becoming a jazz standard – recorded by everyone from Sidney Bechet to Albert Ayler – it survived into the rock era via recordings by Jackie Wilson, Fats Domino, Harry Belafonte, Mahalia Jackson, Elvis Presley, and the Kingston Trio. Armstrong’s claim that he was the first to record “When the Saints Go Marching In” should therefore not be taken too literally. 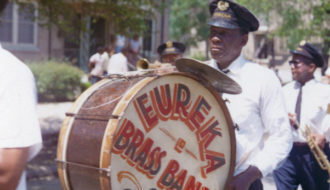 But his recollection of having played it regularly as a “coming back” jazz strain in New Orleans brass band funerals before 1922 tells us that the song’s place in New Orleans jazz history predates all recordings. 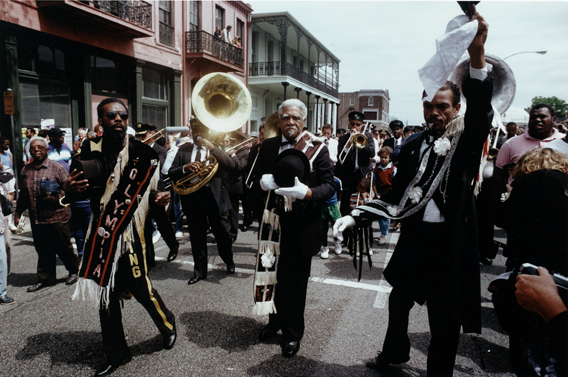 The jazz funeral is where “The Saints” took on its meaning for most New Orleanians. While it is invariably performed as an instrumental on such occasions, the lyrics of the song reveal the spirit of catharsis that moves the second line and explain why it has been adopted as the city’s anthem. Raeburn, Bruce "“When the Saints Go Marching In”." In https://64parishes.org Encyclopedia of Louisiana, edited by David Johnson. Louisiana Endowment for the Humanities, 2010–. 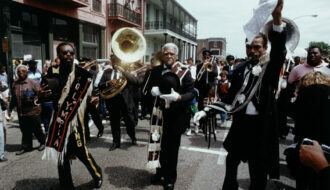 Article published June 24, 2011. https://64parishes.org/entry/when-the-saints-go-marching-in.